Yamaha Tricity, Three Wheels Scooter. Well after Piaggio and Peugeot Quadro, Japanese Yamaha enters the scooter market with three wheels. Its new model produced in Thailand is also available under the brand MBK sister. 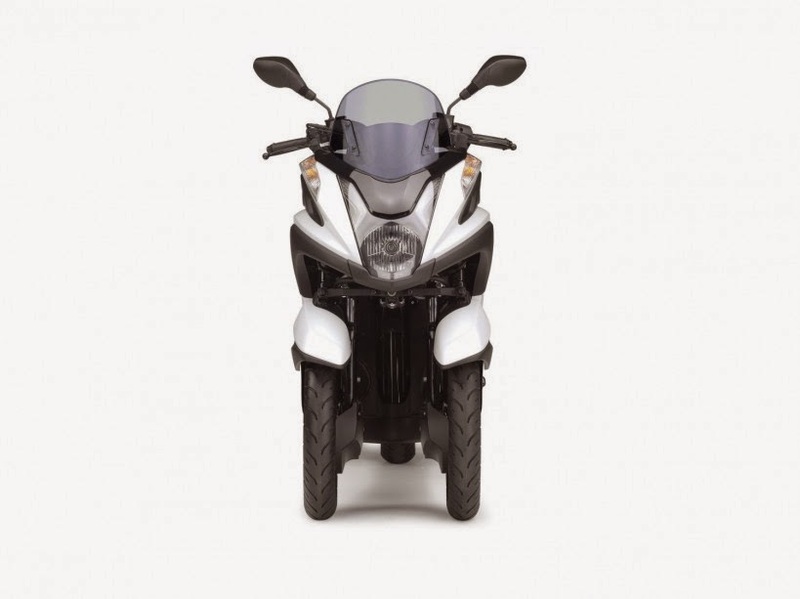 Primarily designed for urban use, the Tricity 125 has remarkably compact and shows more than a scooter menu GT 125, as the X-Max for example. Tricity dimensions are comparable to those of a small two-wheeled scooter. Despite the presence of the LED lights front and rear, the design does not shine by its audacity and modernity. The Tricity is distinguished by a very flat floor to ask a bag. An eye-bag is also present in the deck. His lengthy saddle proves neither too high nor too wide, which allows those who have small legs to easily put your feet on the ground. Beneath it, you can easily store a full face helmet but only a small bag, since the location is rounded. The passenger has two handles to hold and rubber foot rails. At the front, we would have appreciated the presence of a small storage and flyscreen is too small to protect from the weather, just like on a scooter with big 16-inch wheels. We finally focuses on the pretty picture and fully digital full board, including the time at room temperature and left to right. Some practical information can be scrolled for maintenance, as the time until the next oil change or change in the belt. To a scooter as three small wheels with a distribution of masses before ideal rear 50/50 Yamaha uses a nosewheel compact and a tubular frame. The system relies on a parallelogram aluminum that links with a double telescopic suspension travel of 33 mm. There is no tilt lock system, the Tricity stationary on its side or main stand. The wheels are 14-inch and the channel width is 385 mm, 8 cm smaller than MP3. Yamaha Tricity, Three Wheels Scooter. By design, this scooter appears very light with only 152 kg fully fueled. It is about 40 kg less than an MP3 Yourban and 80 kg less than a standard MP3. By cons with that track width, the engine is only 125 cm3 but we will see that this is not a handicap for the city. A final technical point is to raise the braking is ensured by 3 disc brakes with ABS, but with an automatic coupling front / rear. Of course you can be disappointed not to have a single-cylinder 125 cm3 of 11 horses to animate the Yamaha MBK Tryptik or Tricity, but his agility will quickly make us change our minds. 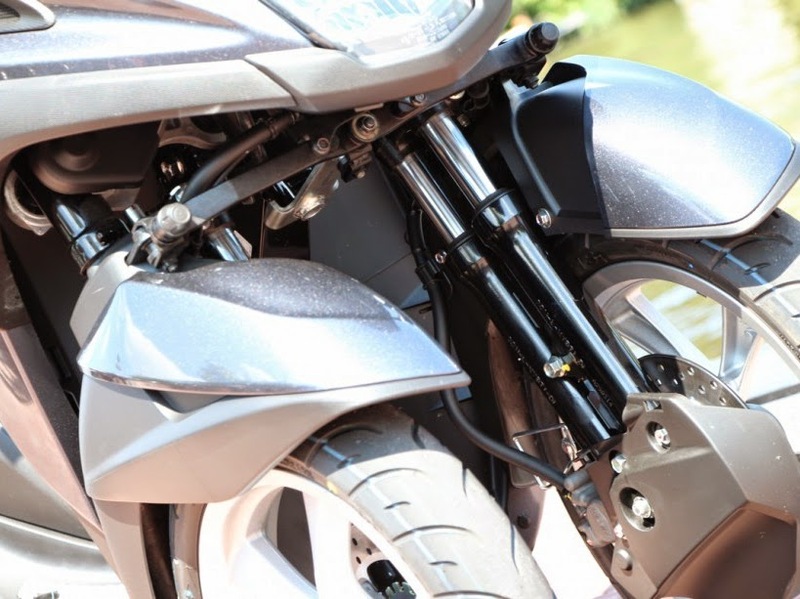 With only 146 kg on the scale without fuel and a low and narrow seat, her grip proves of great ease. There is no heaviness on the front, even when descending stairs or when turning in a handkerchief. 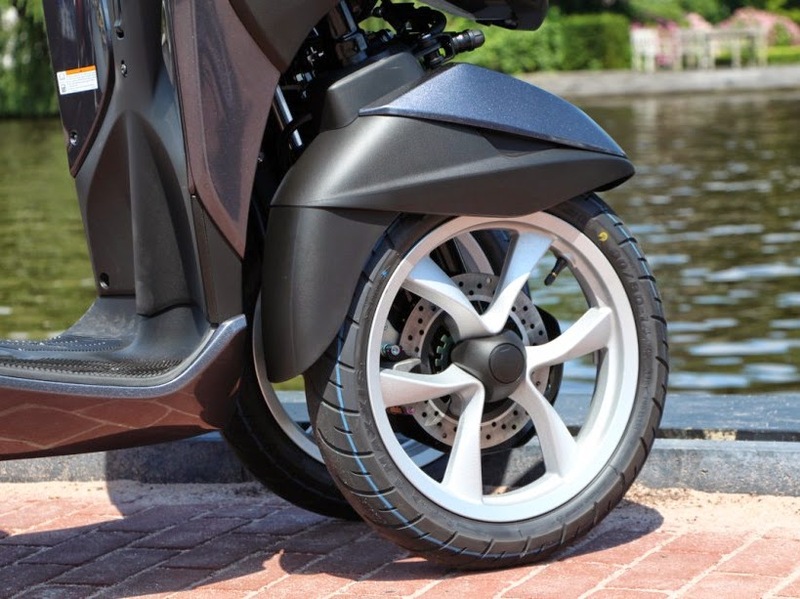 It is found on the handlebars of the three-wheeled ease and stability of a two-wheeled scooter with large 16-inch wheels. 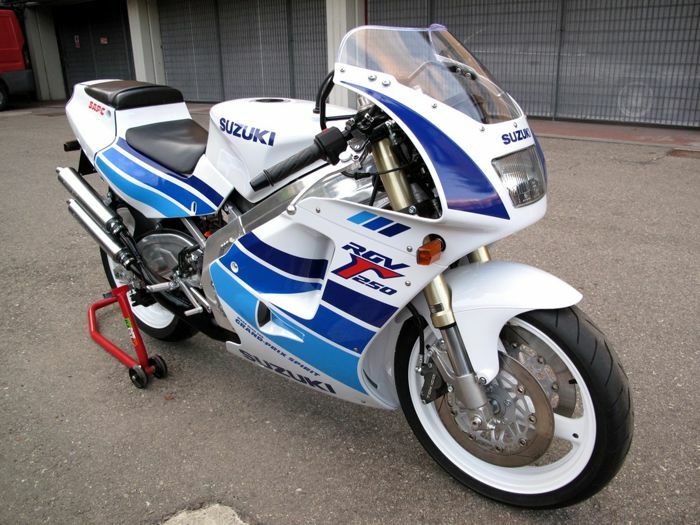 The only regret comes from the single-cylinder 125 cm3 liquid-cooled, but only 2 valves 4 and not like an X-Max. Although it is quite responsive in a loaded traffic to jump, it's a little bother to reach its top speed slightly above 90 km / h by sitting up straight. For the rest, the handling and stability to the handlebars of the 3-wheel scooter is excellent and really reassuring, even for smaller riders. Braking is in the same vein. Certainly there is no ABS braking but coupled front / rear is very discreet, easily measurable and actually effective. The large 14-inch wheels at the front and double suspensions provide both an excellent feeling and comfortable, this is less the case in the back with the small wheel 12 inches and classical suspension. However, if we disregard the saddle pushing forward a bit big guys (1.80 m), handlebar hospitality is very nice. In a few meters, you completely forget having three wheels, since no regrets no heavy feeling on the front. 3 wheel scooter Yamaha Tricity (or MBK Tryptik) finally launching this acclaimed Japanese market in France. Intended for the city and a global customer base, it responds perfectly to urban use with success by combining maneuverability, stability and ease of handling. Of course one can criticize his lack of vigor engine to compete, but the Tricity advantage of its light weight and allows the blow to Yamaha to display a close consumption of 2.5 liters per 100 km (41 km / L). Its compact size, low weight and lightness of its front end make it accessible to all without apprehension. In the end for small urban and commuting, it is regretted that the boot volume fairly low despite the presence of a rear wheel 12 inches only. The homogeneity of the Tricity convincing. It is available at a price of 3799 euros making it in France, 3-wheel cheapest market, compared to € 6,299 claimed for the cheapest of the Piaggio MP3, Yourban LT 300 or € 5,999 a 3D Quadro 350.